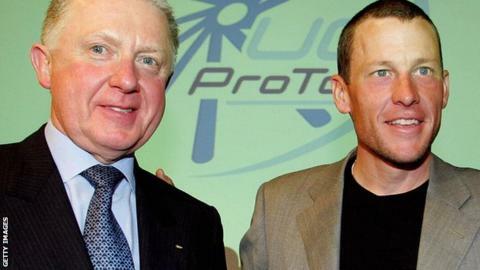 Lance Armstrong claims the ex-president of cycling's world governing body knew he was doping and helped cover it up. The American was stripped of his seven Tour de France titles last year before admitting he had taken performance-enhancing drugs during his career. Armstrong told the Daily Mail that Hein Verbruggen helped him avoid a ban in 1999 by agreeing to blame a positive test on a backdated prescription for a steroid cream to treat saddle sores. Verbruggen has denied any wrongdoing. Dutchman Verbruggen was president of the International Cycling Union (UCI) when Armstrong tested positive at the 1999 Tour de France. The American says Verbruggen approved the idea of backdating the prescription to help protect the image of the sport. Armstrong, who 'won' his first Tour de France in 1999, told the Daily Mail: "The real problem was, the sport was on life support [after the 1998 Festina drugs scandal]. And Hein just said, 'This is a real problem for me, this is the knockout punch for our sport, the year after Festina, so we've got to come up with something'. So we backdated the prescription." In a letter to the national federations, published earlier this month, Verbruggen said his conscience was "absolutely clean". He wrote: "I have never acted inappropriately. With the benefit of hindsight, however, I admit that I could have done some things differently, but I do not accept that my integrity is in doubt." Current UCI president Brian Cookson was elected in September promising that establishing independent anti-doping procedures and carrying out "a swift investigation into cycling's doping culture" were his priorities. The organisation claimed in a statement that it would fully examine its own role in the scandals of the past. "The UCI's Independent Commission of Inquiry is in the process of being set up," it read. "The commission will invite individuals to provide evidence and we would urge all those involved to come forward and help in its work. "This investigation is essential to the well-being of cycling in fully understanding the doping culture of the past, the role of the UCI at that time and helping us all to move forward to a clean and healthy future." Verbruggen is still a member of the International Olympic Committee (IOC) which responded to Armstrong's latest claims by questioning his integrity and stating that it would wait for the UCI's own conclusions before acting. "It is hard to give any credibility to the claims of a cyclist who appears to have misled the world for decades," read an IOC statement. "We await proper considered outcomes from this investigation rather than rumour and accusation." In August 2012, Armstrong was stripped of his seven Tour de France titles and accused by the United States Anti-Doping Agency of the "most sophisticated, professionalised and successful doping programme sport has ever seen". After repeatedly denying accusations of doping, he finally admitted in a television interview with chatshow host Oprah Winfrey in January that he had taken performance-enhancing drugs during his career.